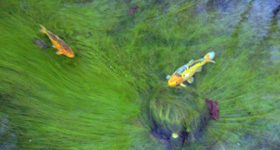 Filamentous algae (or fibrous algae and slimy algae) make poor demands on temperature and water quality. They can grow under circumstances when micro life and water plants cannot yet develop optimally. Besides, they absorb nutrients and catch sunlight so that water plants get a poorer chance. As their name indicates, filamentous algae are filiform. Long green filaments which have been attached first to walls and plants, looking like clouds. In a later stage of growth they often come loose and start floating. Their colour passes from green on to yellow and brown and end in a dirty mash. If filamentous algae are present the water is usually clear. The presence of filamentous algae means that the phosphate content is very low or even absent whereas the nitrite content is low. After winter there almost inevitable residues of nitrates in the pond water. The filamentous algae will benefit by the situation and grow till the nitrates are finished. Than they will stop growing, come off as yellow brown green slimy balls floating on the water surface. Additional effects are a low CH value, a high pH value and nearly always stagnating growth of oxygen producing plants. Cover 50% of the water surface with plants, so that they will absorb the nutrients present whereas algae do no longer stand a chance. Inspect the pond water: an ideal GH value will range between 8 and 12° GH. If necessary, bring hardness to the level. Activate micro life applying means to this end. Regularly remove filamentous algae from the pond as much as possible. When removing algae an oxygen source will disappear. In that case you are advised to aerate the pond water. As the number of plants will grow in volume, the growth of filamentous algae will decrease. To remove the algae you can apply once or repeatedly an algae fighting means. This works excellently. The algae will disappear quickly. However, the cause of the blue-green algae will not be taken away. So, without the above measures the growth of blue-green algae will start all over again. A lasting solution to remove algae definitely is to apply an electronic fighting equipment. Owing to electric pulses between the copper anode and cathode from stainless steel, copper ions are released, which will fight filamentous and slimy algae quickly and simply and prevent them from developing. The copper anode, which takes care of the removal of algae, will last about one pond season. Replace it in spring to achieve a lasting result.